Job was an historical person, as the genealogical information in the Bible makes clear. He was the great grandson of Nahor, Abraham's brother. His maternal grandfather was Nahor's son, Uz the Elder. According to I Chronicles 1:42, the elder Uz's daughter married Dishan, the Horite. She named their first-born son Uz after her father, according to the cousin bride's naming prerogative. Job was of the clan of Uz. He was a Horite. The Horites were a caste of rulers who controlled the trade routes. Originally, they controlled the major waters systems at a time when the Sahara, Arabia and Mesopotamia were wetter. They were devotees of Horus, who was born miraculously of Hathor-Meri by the overshadowing of the Sun (the Creator's emblem). The Horites served as shrine and temple attendants and many were priests who interceded for others and offered sacrifice. Job offered sacrifice daily for the sins of his own family. At the end of the book, God tells Job to pray for his kinsmen Eliphaz, Zophar and Bildad. This is reminiscent of Abraham praying for Abimelech and his whole household (Gen. 20:17,18). Job's people were associated with the Dedanites and the Temanites. Clearly the author of the book of Job was writing well after Job's time because he ridicules Job and his kin as people from the desolate wilderness who live in the clefts of the valleys and in the caves. He portrays them as "donkeys braying among the bushes" (Job 30:3-7). This is not how Job himself would have regarded his kin. We can be fairly certain that the author of Job was not someone who lived in that part of Canaan that was Horite territory. There is a very old tradition that the God of the Hebrews (haBiru) "came from Teman. This is reflected in Habakkuk 3:3 which states, "God came from Teman, the Holy One from Mount Paran." This is one reason that Frank Moore Cross believes that the God of Israel is the God of the Horites. Job and his kin dwelt in the hill country of Canaan and built shrines in caves such as at Petra. It is not surprising that Petra reflects Horite beliefs. Horite ruler-priests shaved their heads (Jeremiah 25:23), as was the custom of Horite priests. Esau the Younger had a son named Korah which means shaved one. This suggests that this was a confederation of Horite priestly families. Genesis 36 confirms this, listing Uz's grandson Dedan as a Horite ruler. Here we also find reference to Huz or Husham of the land of Tema (Gen. 36:34). The people of Uz belonged to a 3-clan Horite confederation. Their kin and allies were the Dedanites and the Temanites. The clan of Teman descended from the elder Esau's son Teman (Gen. 36:11). The Temanites were known for their wisdom. Job's friend Eliphaz was a Temanite. Jeremiah 49:7 speaks of the wisdom of Teman and verse 8 links the Temanites with the Dedanites. The largest collection of texts in the oldest Arabic script come from Tema and Dedan in the Hijaz. Tema is known by Arabs as Taima and lies about 70 miles north-east of Dedan. Tema, Dedan and Dumah were caravan stops along the trade route from Sheba to Babylon. According to Genesis 10:7, Dedan the Elder was descended from Kush, the son of Ham. According to Genesis 25:3, Dedan the Younger was a descendant of Abraham and his cousin wife, Keturah. Dedan's father was Abraham's first-born son Joktan. Isaiah 21:13 speaks of the "caravans of Dedanites" in Arabia, and Ezekiel 27:20 speaks of Dedan as supplying Tyre with precious things. Dedan is associated with Uz in the hill country of Edom, Job's homeland. 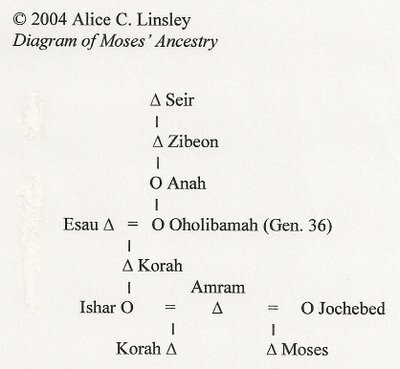 This is Uz the Elder, son of Nahor, whose grandson (by his daughter) was Uz, the son of Dishan, shown in diagram above. 1. Moses had a half-brother named Korah. 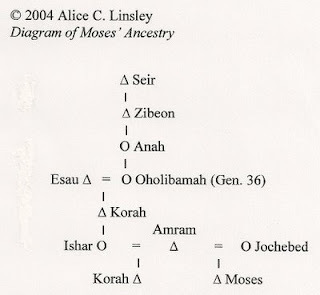 (See Moses' family diagram below.) Shaving the body was the custom for Horite priests in Egypt. See Biblical Archaeology Review, July/August 2007, p.37. According to Numbers 26, Korah's claim to be the ruler was supported by the Hanochites (descendents of Nok through Jacob's first-born son Reuben). The diagram below shows the typical marriage pattern of Horite rulers. Amram had two wives. One was a half-sister (Jochebed) and the other was either a patrilineal cousin or niece (Ishar). 2. The Horite confederation is not identified as Uz, Huz and Buz, but rather as Dedan, Tema and Buz. 1) Bible says that Moses was from the tribe of Levi, however you ancetral pictures indicate that Moses came from Esau. 2) I have read certain commentaries indicating Job was the third son of Issachar, sone of Jacb. Do you not agree? Moses's father was Amram, a Horite priest. The Levites were the priests. Horites lived in Egypt, Sudan, Upper Nile, Mesopotamia, and Edom. There are two named Esau. I assume you are referring to Esau, Jacob's brother. Both Jacob and Esau were Horites. Most commentaries overlook the distinctive Horite marriage and ascendancy pattern and are therefore often mistaken. Those people who have the red skin are Caucasian and Negroid? The Ainu have Caucasoid features and still have genetic connection with black-skinned people, but they do not have black skin ... Horites, Egyptians from Upper Egypt, Edomites ... They were all Ainu?